Accepted full-papers will be presented at Eurographics 2011 and published in a special issue of the Eurographics journal, Computer Graphics Forum, in print and online. We encourage submission from all areas related to computer graphics such as rendering, modelling, visualization, animation, virtual reality, computer vision, imaging, and related disciplines. 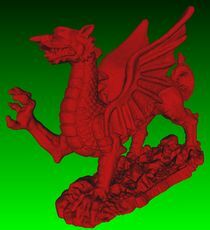 We have scanned a Welsh Red Dragon for EG2011. The data is available for download and freely available for your research. You are encouraged to use this model during the conference to help demonstrate you latest research ideas.